Valentines Day shoot Feburary 14! Come to a unique date night on Valentine's Day and try beating Cupid at archery! Bring a friend, relative or significant other as your Valentine's partner. There will be fun archery instruction, practice, games and refreshments. 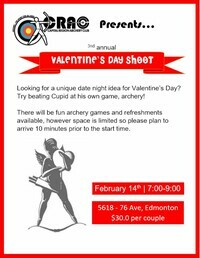 8 - 9 pm - "Cupid's Path Game” - Work with your Valentine’s partner to gather points at different shooting stations. Would you together win the prize?